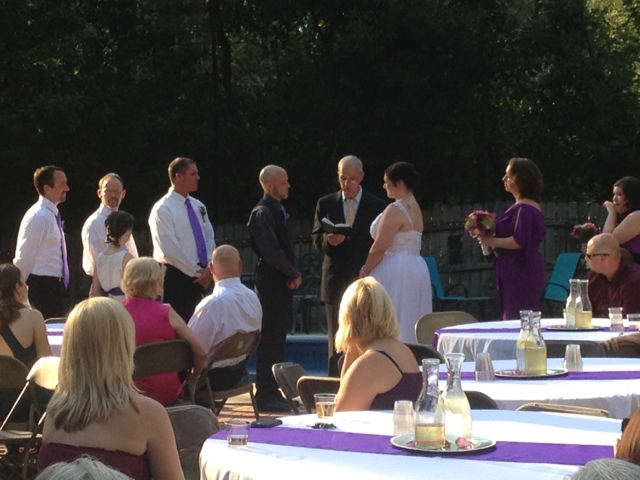 Last weekend, Kristin and I went down to Louisiana, where my sister, Rebekah, was getting married. 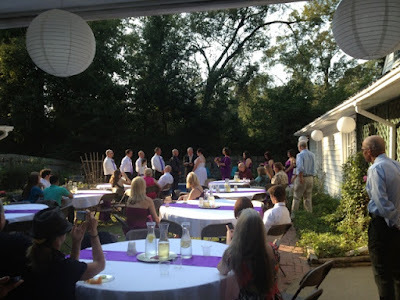 It was a simple, and relatively inexpensive, wedding at my parents' home in St. Francisville. Here's a picture, so you can get an idea of what it looked like. The wedding party. My sister and Vance with the minister in the center. My other sister, Sarah, on the right, and her daughter, Hope, in the white dress in front of the groom's party (she was a co-ring-bearer, since there were already three flower girls). The minister and the bride and groom are standing just in front of the in-ground pool, which you can see in the background. I was kind of worried about what would happen if the minister took a step back. The wedding was short, and the food afterward was plentiful. A zoomed out view, so you can see the tables set up. On the right side are the porch and garage, and you can just see the Master Bedroom extension of the house poking out on the left--well, more specifically, the gutter attached to that extension. The tables were lined up in between, and the wedding procession walked down the aisle in between. 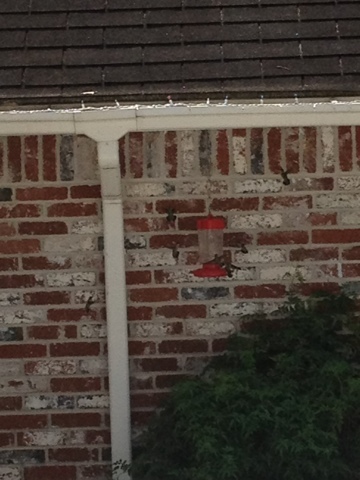 The hummingbird feeder, and its attendant hummingbirds. The birds were quite disappointed when it was removed for the wedding. You could see them wandering around in confusion, looking for their meal. The next day, Rebekah and her husband went to honeymoon in New Orleans. My wife and mother drove them down, and spent the day there. I stayed in St. Francisville and babysat my two nieces. They're old enough that if you give them an iPad or Kindle Fire, they'll be nice and quiet for a good while. I think we all had more fun this way. Great photos, great couple, great everything! You made me look forward to my perth wedding photography!